If I’m haughty lordling slave, by Nature’s law designed. Why was an independent wish E’ er planted in my mind. If not, why am I subject to his cruelty scorn? Or why has man the will and power to make his fellow born? that the new grade had to be part of the Locomotive Department and the Motormen being represented by A.S.L.E.F. at all. 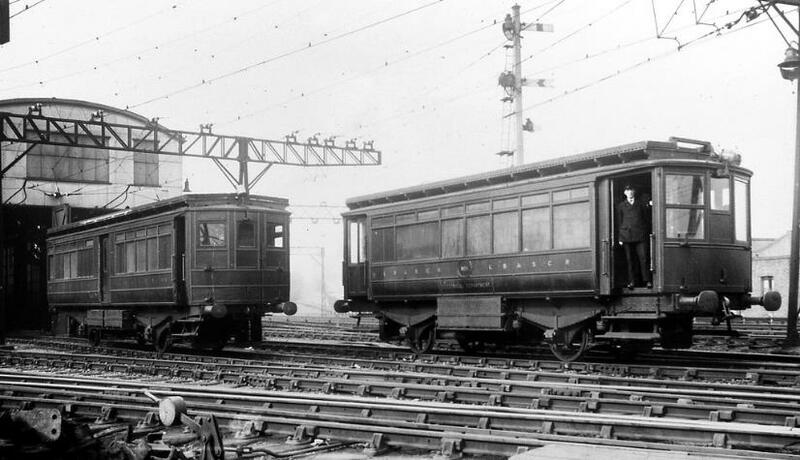 The first experimental electric train ran between Battersea Park and East Brixton on Sunday 17th, January 1909. After several postponements of opening dates, the full service between London Bridge and Victoria was inaugurated on Wednesday lst, December. 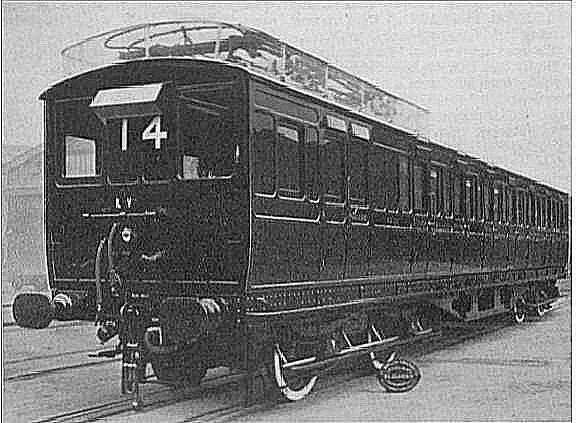 The basic service at 15 minute intervals was essentially the same as had been provided in steam days, but journey time was cut from 36 to 24 minutes. For marketing purposes the title of 'Elevated Electric' was adopted. compartments, the sets seating 132 third and 56 first class passengers. All vehicles had side gangways between compartments to improve passenger flow, and were considerably better appointed than most stock running on the Brighton main line at the time! The opportunity was taken to abolish second class, which disappeared from all suburban services in 1911 to be unsatisfactory. Already first class accommodation was excessive and overall there was excess capacity off-peak and overcrowding at peaks. The sets were re-formed into 2-car units (running in pairs at peaks). 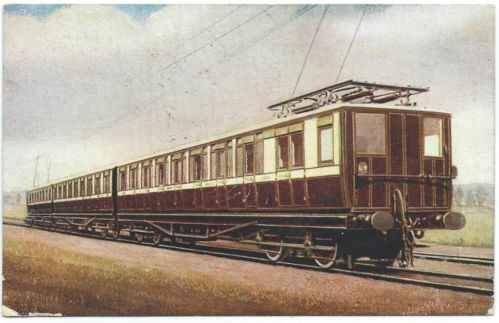 The original motor coaches were retained coupled with driving trailers converted from bogie suburban steam stock and provided with six third and two first class compartments.The first class trailers were withdrawn and equipped for use on steam trains on the main line to Brighton, but in due course were converted again for the West Croydon and Wimbledon electrification. trains. In the foreground is a petrol driven vehicle purpose-built for the maintenance of the overhead wires. most Motormen were retrained Firemen or Guards who were already on a comparable rate of pay. 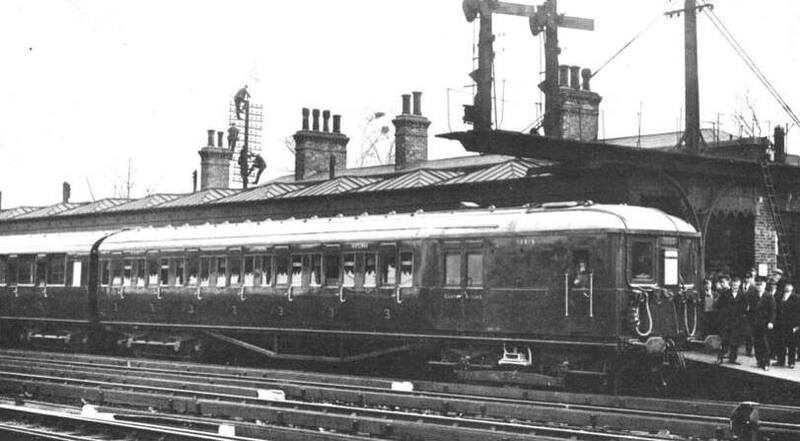 The Line between Streatham-Tulse Hill was AC electrified in 1913 but was never used in passenger service. freight inter-change service to New Cross (Gate). The electrification of the main-line between London, Brighton and Eastbourne, is, we understand also under consideration. Board of Trade inquiry is being held. London, Brighton and South Coast Railway, and finding matters favourable, I made the necessary arrangements. it is by organizing in our Society and thus joining hands with other electric motor-men. 1st Outing to Arundel on Sunday 18th August 1912.
in the near future, receive a rude awakening. glad to receive articles on any subject of general interest. All communications to be sent to Mr. A. Fox, General Secretary. out between the masters and the men I anticipate they will result favourable to both. Extracted from the New Cross Branch report. few years hence it will become more generally adopted. I trust that the men on other lines will take the advice Brother J.
must mind their own business and trust their affairs in the hands of men capable of looking after their interests. Extracted from the Nine Elms Branch report. certainly should be a lesson to us to prepare for the future, and this can only be done by ourselves in our own Society. position carried the steam drivers' rate of wages, and the agreement thus secured formed a precedent, followed later by the L.
& N.W. and other electrified lines. Extracted from the Battersea Branch report. the London, Brighton and South Coast Railway officials promoting other than locomotive drivers or firemen to motormen. Mr.
men continuing to be employed as motormen. Mr. J. Cordrey then moved the following resolution, which was seconded by Mr.
consideration so as to get the best system. months ; it's only a question of will it pay ? Once convinced of that and there is no hesitation in scrapping men or machinery. it will mean that the matter is practically settled for other companies' men, when and wherever electrification comes about. The delegates fully realized this at the Conference in May last, hence the resolution. question for locomotive-men will be peaceably settled in their favour. natural it will be resorted to to swell dividends. It is no good trying to disguise the fact: electrification has come to stay. this settlement as a deciding factor for all. unsettled, awaiting the further decision of the men. Billinton and the deputation was told that their demand for exclusive right to appointment as motormen could not be granted. between Selhurst and Norwood Junction, above is a view of the A.C. Maintenance Shed constructed. the full 8 hours without a meal break. London and South Western Railway. would be provided for Motormen. 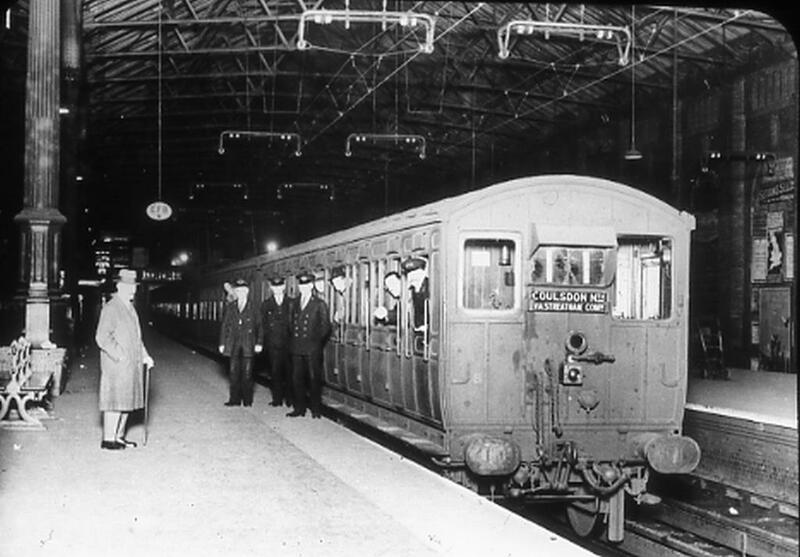 of motormen, only a curtailed service of electric trains was in operation. 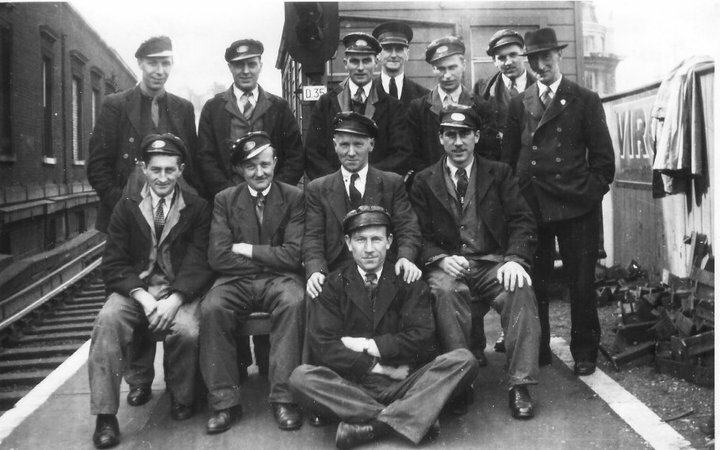 The Drivers and firemen who belonged to the National Union Railway-men continued to work normally during this dispute. Uniforms or overalls were not issued to Enginemen up to at least 1904, if not later, then only an overcoat every 2 years. "This was granted and upon pressure being exerted by our Society, other lines followed suit at a later date"
Motormen of 3 suits of combination overalls 1 top coat, 1 reefer jacket, and 2 caps to be supplied was in 1919. Cross, Cannon Street, Borough Market Junction, London Bridge and New Cross, and on the tracks linking up these stations. services of both passenger and goods trains. proved equal to all the demands made on it during the previous four years. Copyhold Junction and Haywards Heath, will be found at the end of this publication. Hastings line to the East and the Worthing and Portsmouth line to the West (the line joining that from Preston Park at Hove). 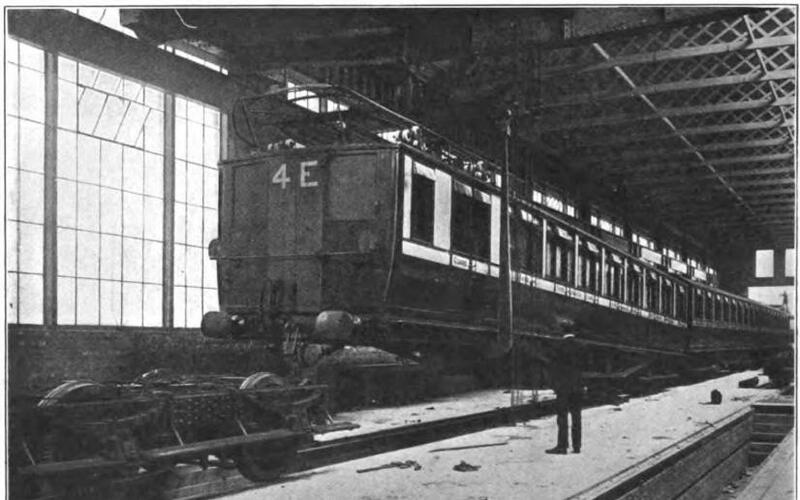 repair shops, large carriage sheds and washing plant for electric stock. 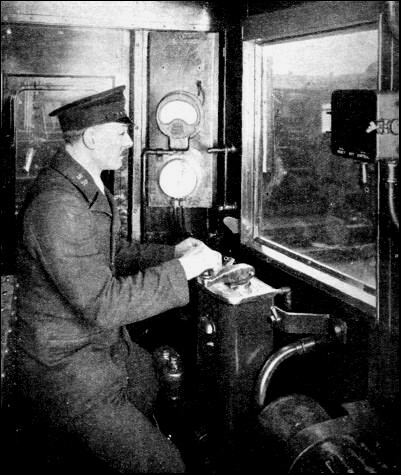 The general signalling scheme employed three-aspect colour light signals throughout for running signals and two-aspect colour light signals for shunt movements. Exceptions to the general rule are to be found in cases where it has not been possible to obtain full braking distance, and here four-aspects were used to maintain the necessary flow of traffic. With a single exception all other types of signals, such as call-on and warning signals were eliminated, thus adding greatly to the uniformity and simplicity of the system without interfering in any way with expeditious handling of traffic. 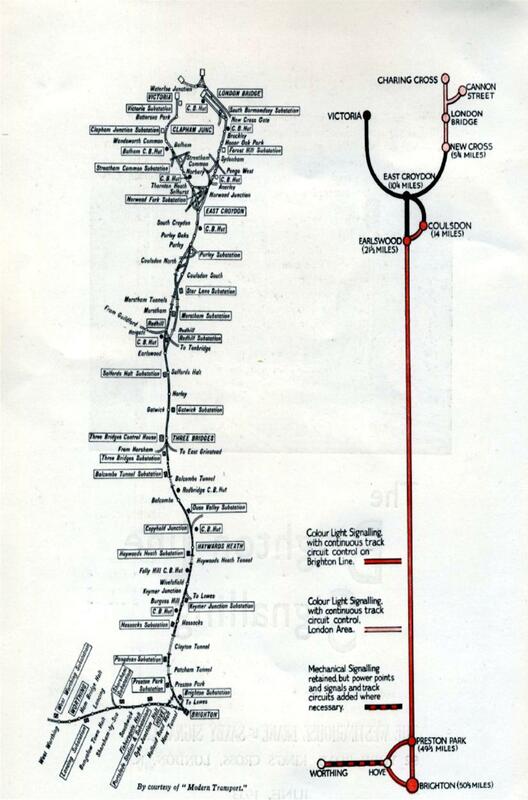 The system of control adopted between Coulsdon and Preston Park, a distance of approximately 31 miles, is electro-mechanical with continuous track circuiting of all running roads, and track circuit fouling protection of junctions and sidings. At Brighton the system is all-electric, controlled from a new cabin containing a 225-lever power frame. In the electro-mechanical section certain cabins were selected for retention in service and all others have been abolished. The selected cabins are those from which the routing of trains is always being carried out, or where there is at times some shunting of goods trains, or where special regulation of traffic may occasionally be necessary. The above diagram makes it clear the number of cabins totally abolished, those which are normally switched out, and those, such as Earlswood, Three Bridges, Haywards Heath, Keymer Crossing and Preston Park, which are always in service. day of this year marks the ending of a definite stage in the conversion process from steam to electricity. Grid, possesses eighteen sub-stations, the chief of which is situated at Three Bridges. whole of the fifty four miles of line, and with the latest form of equipment, control has become simple and effective. Effective from a transport and dividend-earning point of view, as well as effective from displacement of labour point of view. All this stock was made at the Southern Railway Shops in Lancing and Eastliegh. when operated under State capitalism. under a railway transport system owned and controlled by workers of the country. Union leaders are, when they simply advocate, and work for, rationalisation under the capitalist system. 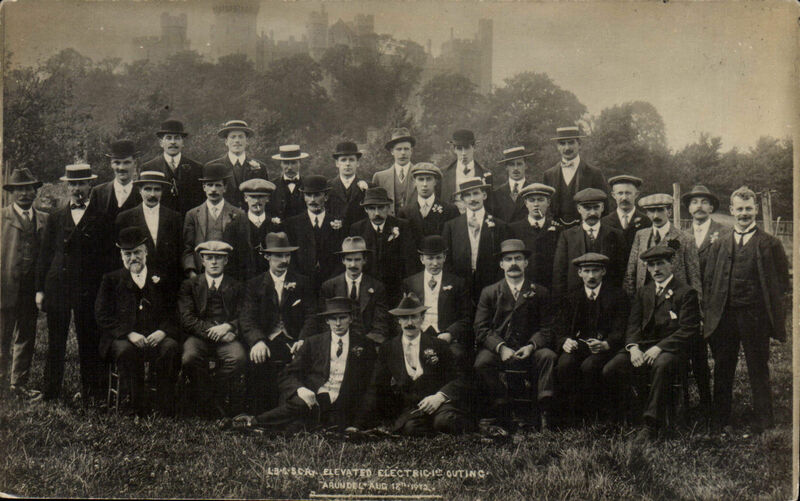 Standing back row L ~ R: Chief Traction Inspector H. Hotts & Bob Wheeler. 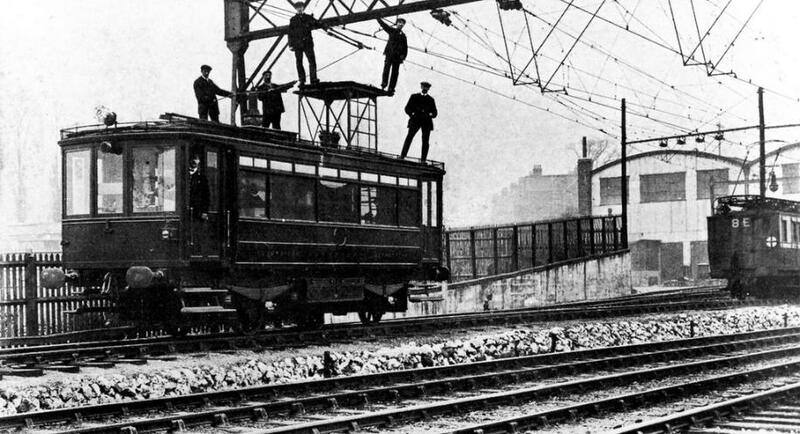 The Traction Inspector S. Bass (in the trilby hat) never worked on the steam and was one of the first Motorman to be employed at Peckham Rye Electric Depot. 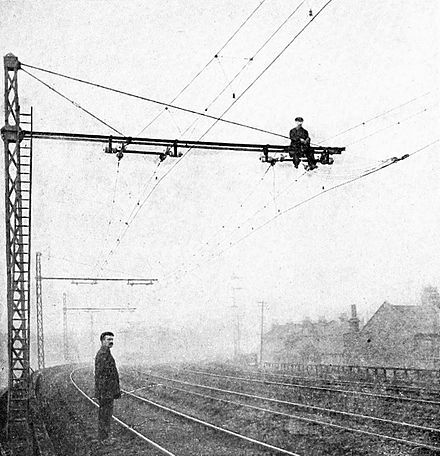 When the L.B.S.C Railway electrified with the overhead wires in 1911. In the early days of electrification a lot of the steam drivers did not want to become motormen owing to the difference in wages, so the railway opened the vacancies to the various traffic grades like Guards and Signalmen and they became Motormen. Ron Fulkner (middle row 3rd from left) who started at Basingstoke as a cleaner and then Fireman in 1938. He got his drivers job at Addiscombe in 1949 and then moved to Farnham in the late Fifties. 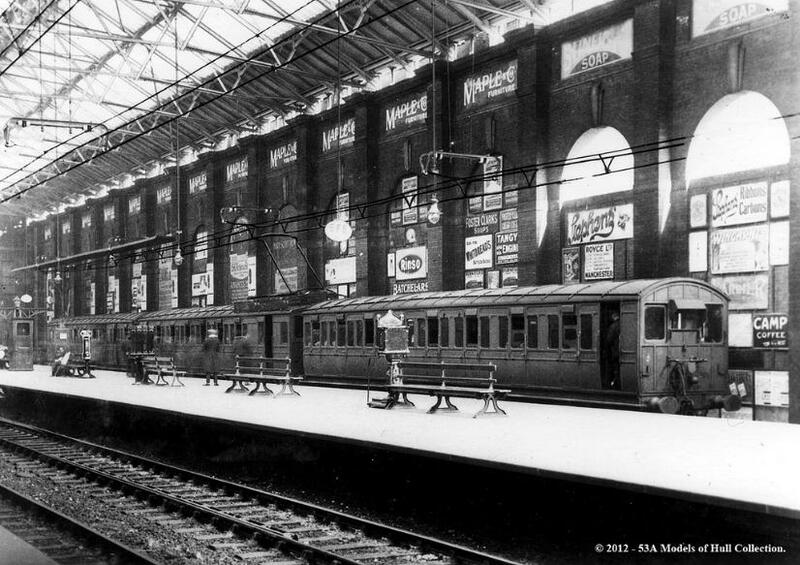 the Motorman's Depot would have closed (this is to be confirmed) and the site was demolished in 1969.
down through the years to the very beginnings of electrification on the railways of Britain. present - day conditions and the good - bad days of the Southern Railway’s “Overhead” system. report on the question of conversion of the suburban lines. were envisaged. 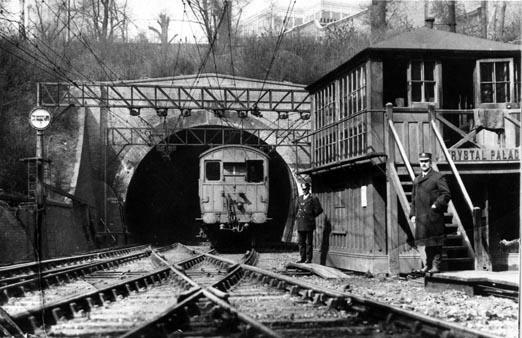 Extensions to Crystal Palace from both Victoria and London Bridge were completed before the first war. 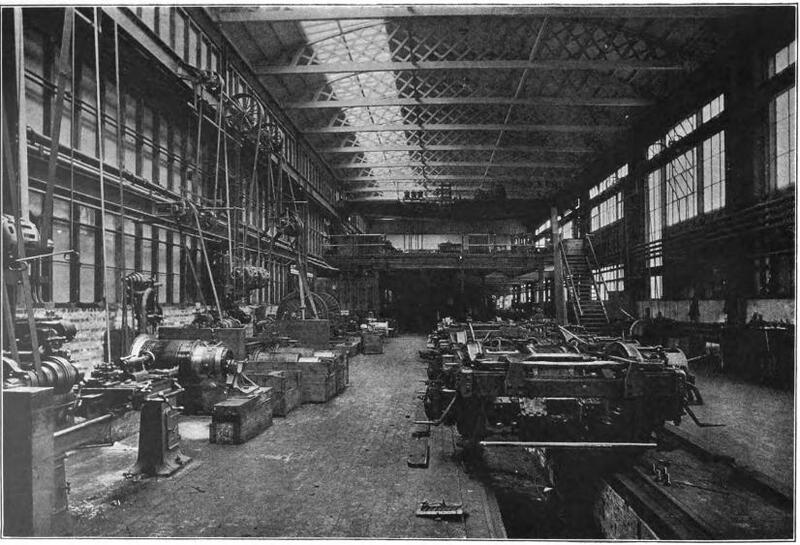 were converted to single - phase traction - and there not until 1925. Putney. The early progress made in the design of low voltage current traction decided the directors to adopt this system. current was adopted as the standard for future conversations. 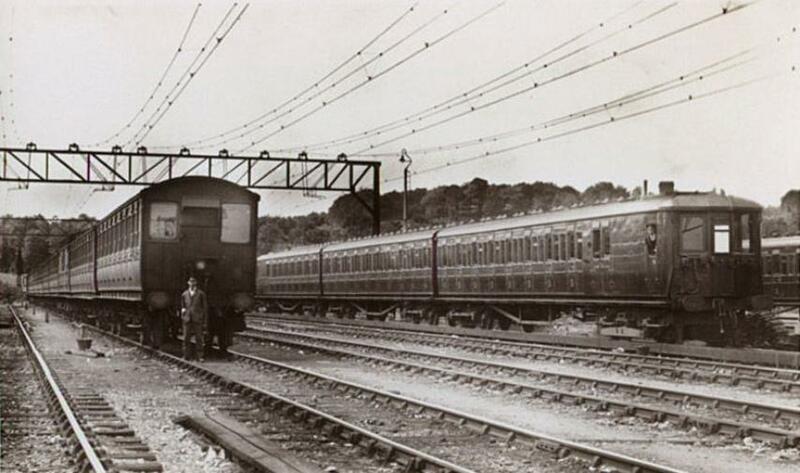 7th July, 1935, when a total of 444 route and 1,156 track miles was operated electrically by the Southern Railway. Worthing, in readiness for the completion of the electrification down to Brighton and West Worthing.